My name is Jeremy Donovan, I am a Kuku-Yalanji and Gumbaynggirr man, and the proud father of four children, including two amazing daughters. My 16 year-old niece has also just come to live with us. As parents, when we think about our children’s future, we want the very best for them. We want them to be strong, safe, and happy. We do our best to steer them in the right direction and to help them from making the same mistakes we might have. It isn’t always easy. In fact, it can be extremely challenging, and that’s because being a parent is the most important job there is. And sometimes we make mistakes. We might say things that are harmful to our partners and children, sometimes we say things without even realising the danger it causes. Most of us, at some time, have heard adults say things to boys like, ‘stop acting like a girl’, or they excuse disrespectful behaviour by saying things to girls such as, ‘it’s just boys being boys’. I know I have been guilty of this in the past. When we are caught up in the day-to-day grind of everyday living, sometimes we forget just how much of an influence we have on our children. How much they are watching us, soaking up all our behaviours and modelling their own thoughts about the world – their own behaviours – on ours. That’s why I believe having healthy and respectful relationships for our children to look up to and learn from – and talking to our young people about the importance of respect – is so important; particularly when it comes to the issue of violence against women. Violence against women starts with the attitudes and behaviours we teach our children. It starts in the comments we make that disrespect women. It starts when we dismiss these attitudes when we see them or are confronted with them. This includes ignoring or accepting disrespectful language towards women as normal, and not teaching our boys about respect, or pulling them up on it when we notice them displaying disrespectful behaviour. This behaviour might include aggressive and offensive language, not respecting a girl’s privacy, bullying and teasing, making hurtful comments on social media, and so on. I grew up seeing all sorts of violence normalised. Disrespectful behaviour towards women was simply normal behaviour. Unfortunately, I still see this happening far too often in our communities. I’ve decided to speak up about it, in fact, I have never been able to remain silent on this matter. I hope others will too, because unless we are brave enough to have conversations with the people that we love the most, this issue is not going to stop and the violence will continue. As a campaign supporter, I implore you to reflect on your own attitudes and behaviours, have the courage to ask for help or ask for advice, and start the conversation about respect with people in your community, and most importantly, with our young people, so that together we can end the cycle of violence. 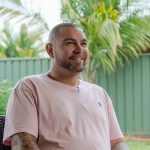 Resources for Aboriginal and Torres Strait Islander people have been produced as part of the national campaign, including a storybook, poster and postcards, and a conversation guide to help parents talk with their children about respect.